A 65-year-old woman presents with a 2-month history of increased anterior/lateral right shoulder pain without trauma. She had previously been treated non-operatively for a small rotator cuff tear – which appears to have have progressed. A 65-year-old, right hand-dominant female presents with a 2-month history of increased anterior/lateral right shoulder pain without trauma. Several years prior, she had been treated non-operatively for a small rotator cuff tear in her right shoulder. She now has difficulty with lifting weights overhead and folding laundry; she also reports night pain. Ibuprofen provides mild relief of the pain. She has no significant past medical history. 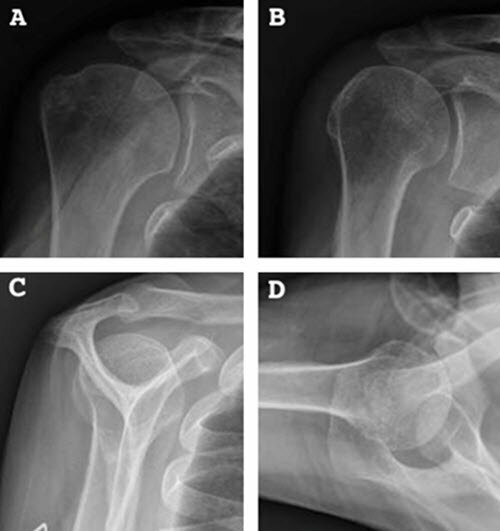 Shoulder radiographs demonstrate mild superior migration of the humeral head, without fracture or dislocation (Figure 1). Note that the axillary view may reveal anterior subluxation of the humeral head in association with subscapularis deficiency, although that was not seen in this patient’s radiographs. Figure 2. Preoperative MRI. The axillary cut on the left demonstrates long head of biceps subluxation out of the bicipital groove, while axillary cut on the right demonstrates a subscapularis tear off of the lesser tuberosity (BG – bicipital groove, LHB – long head of biceps, SS – subscapularis). The patient is scheduled for arthroscopic rotator cuff and subscapularis repair with biceps tenotomy. This procedure is indicated for patients with full-thickness rotator cuff tears, dysfunction, and pain. The type of implant to be used in this procedure is a suture anchor. The patient is placed in the beach-chair position with an arm holder. The lateral decubitus position can be used at the discretion of the surgeon. 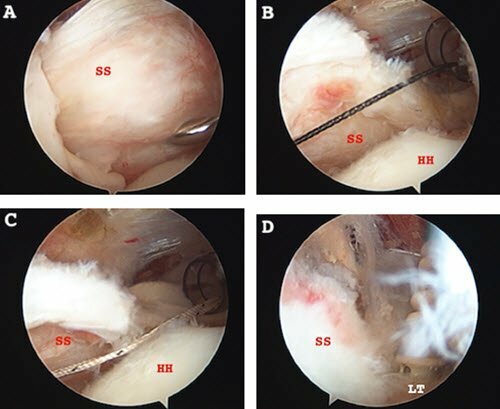 Using a standard shoulder arthroscopy setup, the portals for the arthroscope are placed as follows (Figure 3): A – Anterior portal, placed lateral to the coracoid; B – anterosuperolateral portal, placed 2 cm lateral to the anterolateral corner of the acromion, parallel to the lesser tuberosity; and C – posterior portal, placed 1 cm medial and 2 cm distal to the posterolateral corner of the acromion. 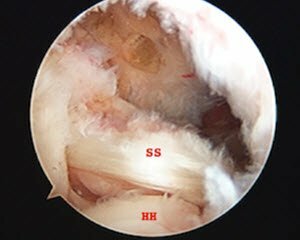 Perform a diagnostic arthroscopy to confirm pathologic lesions, as well as to identify coexisting pathology. Perform a biceps tenotomy to improve visualization and release potential stressor of the subscapularis repair. 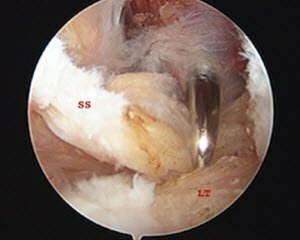 For concomitant superior/posterior rotator cuff tears, perform the subscapularis repair first, when anterior glenohumeral joint visualization is best. The anterior exposure is then done. Open the rotator interval to identify the coracoid, using a combination of shaver and electrocautery (Figure 4). Expose the coracoid after opening the rotator interval. In patients with suspected coracoid impingement, a coracoplasty is performed, as demonstrated in Figure 4B. 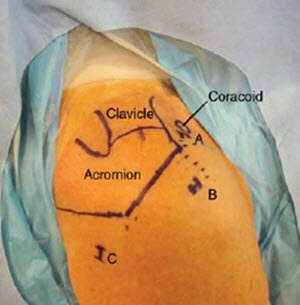 A coracoplasty opens the interval between the anterior subscapularis and posterior border of the coracoid to prevent impingement. The normal interval is 7 to 11 mm. Figure 4. Anterior exposure. In this example of coracoid exposure from a different patient, note the subscapularis (SS), coracoid (C), and humeral head (HH). The lesser tuberosity is prepared by skeletonizing the subscapularis footprint with electrocautery; decorticate the footprint with a burr. Anchor placement is done next. Use the anterosuperolateral portal to place the anchor pilot hole (Figure 5). The upper border of subscapularis tears may need only 1 suture anchor, while complete subscapularis tears may need up to 3 anchors. If more than 1 anchor is utilized, all sutures should be passed prior to knot tying. The upper border of the tear can be fixed in a knotless manner. Knotless suture fixation is described in Figure 6 and Video 1. Figure 5. Anchor placement (SS – subscapularis , LT – lesser tuberosity). Figure 6. Knotless suture fixation (SS – subscapularis, HH – humeral head, LT – lesser tuberosity). Video 1. Upper border subscapularis tear repair – knotless luggage tag technique. Figure 7. Final subscapularis construct (SS – subscapularis, HH – humeral head). This patient returned 2 weeks after surgery to have her sutures removed. Immobilization maintained until 6 weeks following surgery. She then started physical therapy for passive range of motion. At 2 months after surgery, the patient’s range of motion had improved and she progress to phase 2 of her rehabilitation, which included stretching active range-of-motion exercises. A month later, her forward elevation was at 110°, abduction was at 80°, and external rotation was at 30°. She had 4+/5 strength to resisted external rotation, internal rotation, and Jobe’s test. By 5 months after surgery, her range of motion continued to improve. She had 5/5 strength to resisted external rotation, internal rotation, and Jobe’s test. At 8 months after surgery, her forward elevation had improved to 150°, her abduction was 150°, and her external rotation was to 40°. She scored a 9 on the QuickDASH test. Justin C. Wong, MD, and Joseph A. Abboud, MD, are from The Rothman Institute, Philadelphia, Pennsylvania.